The perfect summer salad, featured on WTNH! This morning was so much fun! Miss Liz hosted another cooking segment on WTNH’s Good Morning Connecticut on News Channel 8. The hosts and employees there are all so nice and so much fun! Always a pleasure visiting with them. 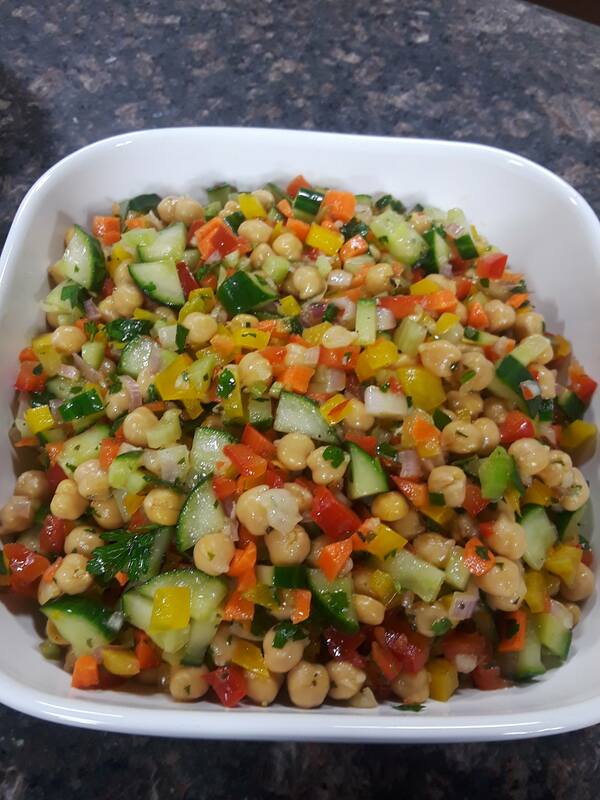 Today, I made Chickpea Salad, the perfect salad for the summer time! Made with a simple lemon vinaigrette, full of fresh vegetables: cucumbers, peppers, shallots, carrots, celery and my secret ingredient, spicy pickles! I absolutely LOVE chickpeas but if you’re not a fan, you can substitute the chickpeas with any other bean. This salad is so versatile, you can even add some feta cheese and kalamata olives to give it a Mediterranean flare or fresh mozzarella and basil for an Italian flare. Today, I had a special guest with me. My niece, Elisa, just graduated middle school last week and today was her official first day of summer vacation! She was so excited to join me in the kitchen at WNTH and meet the hosts! Be sure to check out the video below and recipe – this is a delicious salad to go along with your summer BBQ! Here is a link to the video to watch me in action! Looking forward to seeing everyone at WTNH in July and all my kids at this summer’s cooking camp.